I stamped this super cute Tucan onto copic friendly paper and coloured him in. I decided I wanted to add more colour to his bill so added an extra section with my copic liner - my hand slipped slightly and well it didn't go to plan - he's unique that's for sure! I added a dot of black enamel accents to his eye and also added some glossy accents to his bill. 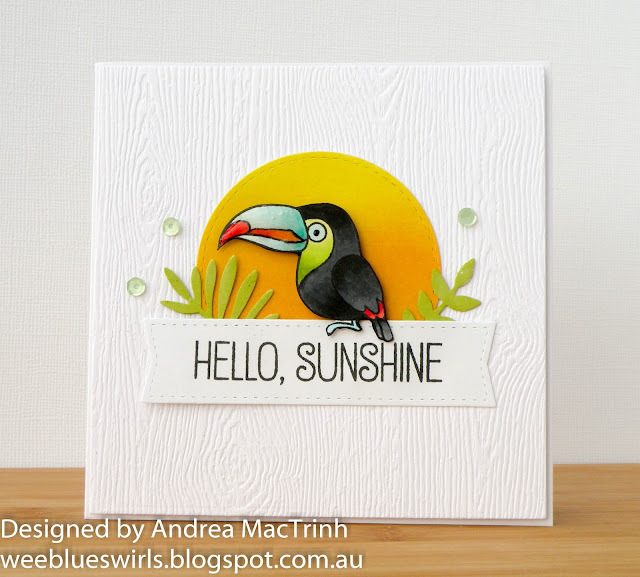 A fabulous card Andres, a lovely design with the woodgrain paper - your blended circle is wonderful and superb coloured cute Toucan with great details and lovely details!! Absolutely gorgeous! I love your bright colours and embossing, such a cheerful, sunny card. Thank you for joining in at Happy Little Stampers. Love it! The colors and texture are fantastic! Love your CAS design and your coloring is awesome! So love this!!! The white background really makes that little tucan pop!!! This is adorable! Love the warmth of the 'sun' - good luck with the contest! Really beautiful coloring on the Toucan, Andrea! I also love how you blended your inks on the background! Gorgeous card! Thanks so much for playing along with us this week at ATSM! This is so totally adorable Andrea! Love the design with the fun image and bright colours. Thanks so much for playing along at Happy Little Stampers. Andrea, this card is super duper AWESOME! It was one of my favorite entries for the contest. Well done!